These high quality diving boards feature a tough, non-slip colorfast acrylic surface laminated to a wood core that gives them additional strength and durability. Our diving boards meet all NSPI standards. FREE SHIPPING! 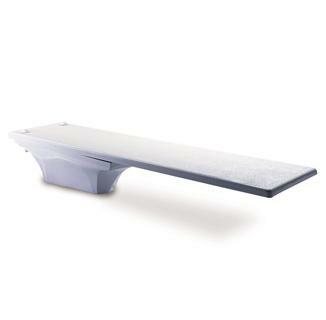 All diving boards come with mounting hardware (dive stand not included) and are backed by a 3 Year Warranty. Note: 10-ft. boards shipped by truckline. Allow 7-10 business days for delivery. One of the most trusted manufacturers of diving boards. These top quality boards are made for durability, safety & good looks. They have a tough outer shell of colorfast acrylic laminated to a wood core for ultra strength & longevity. Interfab boards meet all NSPI standards. Available in white with white trim – all boards come complete with mounting hardware. (Dive Stand not included). 3-Year Warranty. These boards feature a solid wood core for truer spring action. 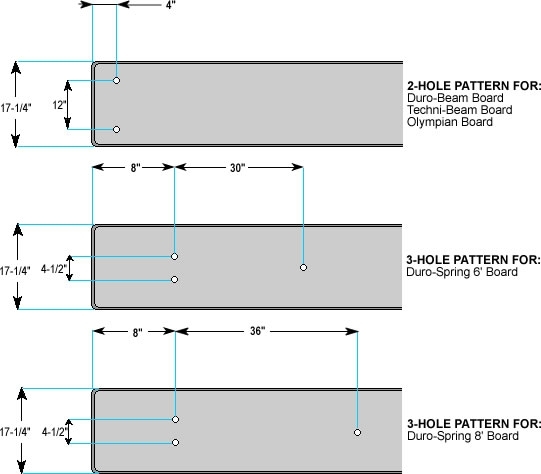 2 hole mounting pattern. Interfab’s highest quality board. Made with a solid wood core for the finest diving action & long life. 2-Hole mounting pattern. These boards made by Interfab feature a solid wood core for great diving action. The Duro Spring has a 3-hole mounting pattern. 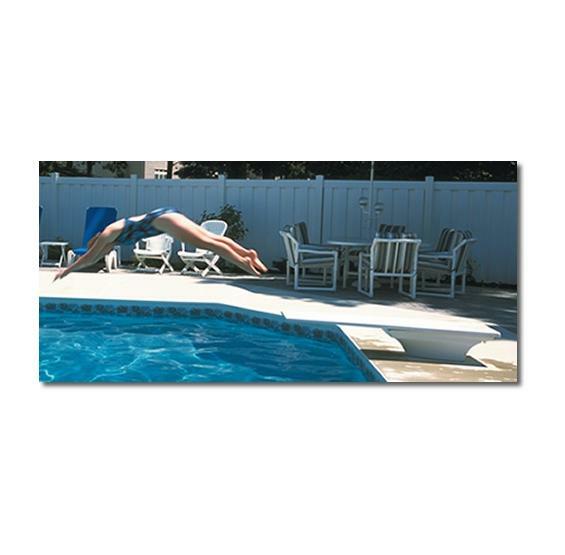 These high quality diving boards feature a tough, non-slip colorfast acrylic surface laminated to a wood core that gives them additional strength and durability. Our diving boards meet all NSPI standards. Available in white with white trim. All diving boards come with mounting hardware (dive stand not included) and are backed by a 3-Year Warranty.